Class of 1973 45th reunion! Class of 1973 45th reunion! Class of 1973 45th reunion! 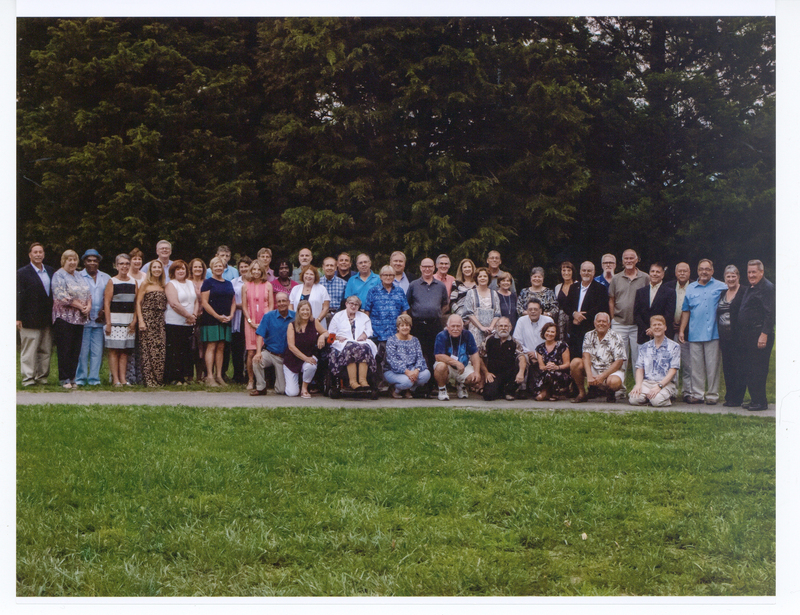 On Aug. 25, 2018, the Albion Central School class of 1973 held its 45th reunion at the Hickory Ridge Golf & Country Club. It was a clear, beautiful summer day to welcome back classmates, refresh memories and catch up with old friends and their families. Classmates came home from: California, Georgia, Ohio, Texas, Ithaca, Rochester, Oakfield, Albion, and Middleport. A special thanks goes out to the planning committee members, who donated their time to research, website maintenance, decorations, music, and name tags and stationery. They were Gail and Steve Pettit, Carolyn (Rustay) Flansburg, Lynn (Neri) Wright, Wendy (Miller) Hinkley, Terri and Mike Vick, Jim DiMatteo, Jim Simboli, Paul Farnsworth, Kevin Doherty, and Barb and Jim Navarra. We all look forward to our 50th. Kneeling, left to right: Norm Phillips, Betsy Batchellor Phillips, Elaine Kursawski Stefani, Kathy Saeva Weaver, Dean Conrad, Earle Allport, Kevin Doherty, June Carr Seager, Chuck Norman, and Eric Robinson. First row, left to right: Jim Navarra, Barb Navarra, Earl Townsend, Moey Hunt Carpenter, Susie Sherman Quenelle, Pam Coffey Marceau, Lynn Neri Wright, Kitty Mackey, Gail Davy Pettit, Steve Christopher, Ronnie Ebbs, Paul Farnsworth, Kaye Harridine Cunningham, Kim Kenyon Cooley, Jim Peglow, Paula Coffey Bardenette, Vicki Pettine Howard, Carolyn Johnson Gibson, Bob Wells, Danny Green, Gary Miles, Jim Simboli, Warren Seager, Jim Reis, Wendy Miller Hinkley, and Frank Strasberger. Second row, left to right: Carolyn Rustay Flansburg, Steve Pettit, Chris Heard Coffey, Danny Wright, Terry Francis Vick, Gary Vanderlaan, Linda Scurry, Mike Vick, Bob Brown, Jim DiMatteo, Nathan Lyman, and Tom Poelma.